We all know someone that keeps crystals in their pockets or hanging in some elaborate wrap around their neck. They swear by the healing power that comes from the stones and try to encourage everyone around them to work with the beautiful gems. There are so many stone-sweethearts out there (including our formulator and a lot of our team members) so we thought we would do a bit of research on what makes crystals so popular. A crystal is technically any solid rock with a geometrically regular structure. This structure is how it is classified—so basically, two crystals with the same structure can look totally different and still be part of the same species. Every crystal is symmetrical along its axis and the external planes that we see indicate its internal order. If you follow all of this symmetry to the core, there is an atom that stays in constant motion, imparting it with its own type of energy. Crystals were created as the Earth formed and they change as the Earth changes. There are hundreds of different types of crystals and they each have their own evolution story—some form under intense pressure or from superheated gas bubbles deep in the Earth’s crust and others form when a mixture of water vapor and magma cool or from a process of erosion—and every evolution story imparts a different type of energy into the crystalline formation. The healing properties of crystals start to make sense when we think about them as an ancient, evolving energy that serve as an access point to energies only otherwise found in the center of our planet and the evolving universe. 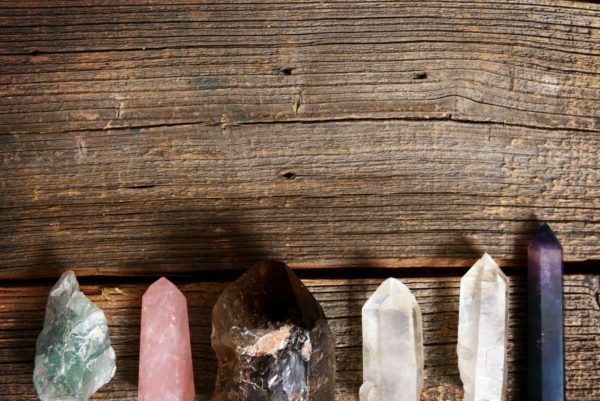 Because every crystal is formed differently, they vibrate differently and each hold their own unique healing energy, which means that are a lot of different uses for crystals and it’s all about choosing the right one. Rose quartz. This is the classic stone of unconditional love and infinite peace. It helps teach the true essence of love, purifies the heart, and deeper healing and self love. It is a helpful emotional cleanser, removing negative energy to replace it with loving vibes and increasing positive affirmation. To use rose quartz: wear it, especially over your heart, or place it in the relationship corner of your room. Amethyst. Amethyst, especially the violet color, is protective of the heart and helps to transmute psychic attack to transform the energy into love. It helps to balance our highs and lows by promoting emotional centering and subtly connecting the physical, mental, and emotional bodies. To use amethyst: wear it as jewelry (a necklace is great), place it facing towards you to draw energy or away from you to push energy. You can use it under your pillow for nightmares. Garnet. A stone of commitment, garnet inspire love and devotion. It’s a great balancer of sexual energy and helps increase potency. It helps to ignite a survivalist instinct, brings courage to crisis, and sharpens your perception of self and others. To use garnet: place it in direct contact with the skin in an appropriate place – fingers, over the heart, the earlobe, or third eye. Carnelian. A very powerful stabilizer, carnelian helps to impart acceptance and courage for positive life choices. It’s lovely for those apathetic days and motivates us to move forward. This crystal is helps to clarify perception and overcome negative conditioning. To use carnelian: in a pendant around your neck or as a belt buckle. Emerald. Emerald is a stone of inspiration and patience. It holds and eliminates negativity to bring about positive action by focusing intention. It offers the strength to overcome the misfortunes of life and stimulates cooperation amongst groups of people. To use emerald: Wear as a ring on little or ring finger or place over the heart. This crystal should not be used on a constant basis as it can saturate and cause negativity. Opal. If you need help exuding positive emotions, opal is your gal. This crystal helps because it is finely attuned to the wearer’s feelings and is used to reflect and amplify those feelings, teaching that three-fold rule (what you put forth comes back to you three times as strongly). It helps strengthen the will to live and encourages taking responsibility for self. To use opal: wear on the appropriate body part to call the energy into that space. Especially useful at the heart, solar plexus, and little finger. Obsidian. Think of obsidian as your shield from outside negativity so that you can do the work on the inner demons. This stone works quickly and can bring internal negativity to the surface but it adds support for that work. Working with obsidian means creating the space to work through the stressors in your life completely and moving confidently towards your soul purpose. To use obsidian: this powerful healer can be put anywhere in your vicinity to call in the energy. Place it next to your bed, around your neck, over your heart, or just hold it in your hand. Amber. This is actually fossilized tree resin rather than a crystal but its connection to our Earth is unmistakable. It helps to protect the wearers connection between everyday self and the higher self to aid in positive and creative self expression. To use amber: wear it consistently over long periods of time on the wrist or the throat. Tiger’s Eye. This stone is traditionally carried as a talisman against ill wishes or curses. It shows true intentions and enlivens integrity while helping the wearer to recognize their true needs. To use tiger’s eye: wear it on the right arm or as a pendant for short periods of time. Meditate with this stone resting on the navel. Peridot. This stone is a strong aural cleanser. Peridot releases and neutralizes toxins and helps to release old baggage, outside influence, and negative patterns. It helps to bring about understanding your higher purpose and necessary change. To use peridot: wear it at the throat or place on the liver in direct contact with the skin. Heliotrope. Also known as bloodstone, heliotrope banishes evil and negativity while helping the wearer stay laser focused on their spiritual calling. This stone helps to remove confusion and bring clarity to unaccustomed circumstances. To use heliotrope: wear it consistently to stay in good health by promoting detoxification or place in a bedside bowl of water. Dioptase. This is a strong mental cleanser and helps to release the need to control others. It helps dissolve ideas of how love should be and brings in positive vibrations of love. To use dioptase: use as a gem essence or place over the heart. These are just a few different popular uses for crystals but there are hundreds of different types, each with their own healing uses. If these are interesting for you, a good place to start is by checking out a book like, The Crystal Bible by Judy Hall—which is a wonderful resource where this information comes from. The one thing that all crystals have in common is that they absorb and hold negative energy. They can become saturated so it is vitally important to cleanse your crystals if you’re using them on a consistent basis. Many people have crystal cleansing procedures like rinsing them in pure water and letting them sit in sunlight or moonlight for a few hours. The healing energy of crystals is subtle but they can be profound. Depending on the goal of your healing, you’ll will put them in certain places on your body, use them with your meditation, put them under your pillow, or place them in specific places around your house. Do you use crystals in your healing? Let us know how in the comments below.